This woman visited a store to some buy groceries, but she walked out with a brand new baby as well. 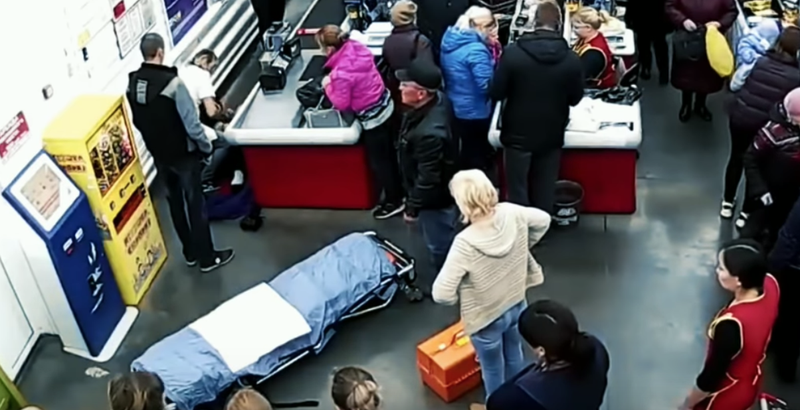 Woman gives birth in a grocery store / Youtube. A Pregnant woman goes to the grocery store and leaves 25 minutes later with a baby after giving birth at the checkout. The 28-year-old Russian woman's birth was captured on CCTV. In the footage, she can be seen cradling her baby bump before telling the cashier that she was about to give birth. Seconds later she was on the floor by the till in the Russian store in Omsk region and baby boy Ivan arrived 11 minutes later. What is the most unusual place you have seen someone given birth? Comment below.